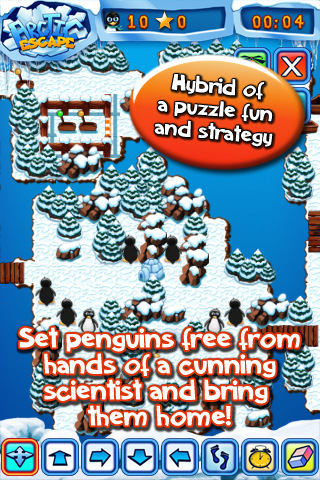 Arctic Escape is an upbeat top-down puzzler by Teyon featuring penguins who were abducted from Antarctica by an evil scientist. Help the penguins navigate around the island and find the exit point back home. This app is a universal binary for iPhone, iPod touch and iPad with a separate Nintendo DSi version as well. 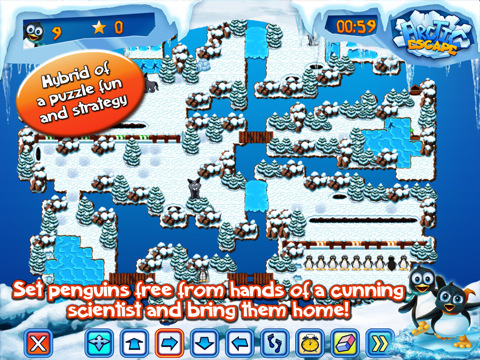 Gameplay involves using commands to help divert penguins away from traps and obstacles, while leading them to a getaway point. Rescue enough of these cute penguins and you move to the next stage. The game has 8 islands and each island has 13 stages. When a stage starts, there are a variety of penguins walking around on the island. Each stage has a map that you can pinch to zoom in/out of and drag around. There are 4 directional buttons that you can place on the map to divert the direction of the penguins’ walk. Place as many as these arrows as you need, and get them to the helicopter. You also have a jump symbol and a wait symbol for managing the penguins movements so they don’t collide. After you place an icon, you can erase it by tapping it again while the eraser is selected. If you find the pace needs to be faster, tap the double right arrows. When you are done you can tap the helicopter and leave the island. Each level adds more complexity to the game and increases its pace. You will have obstacles that you have to get over, around or through to get to the helicopter. There are switches that open doors, breaking bridges to cross, falling items, lakes to swim through, wolves to avoid, and much more. With the amount of resources you have to manage, timing is crucial in Arctic Escape. You’ll be adding and erasing icons a lot while panning around the screen. Also you have to be zoomed in and panning around quickly. I found that when zoomed out, I could see well but the icons didn’t get placed in the right places until I zoomed all the way in. The music in Arctic Escape has an island flavor to it and the 2d graphics are clean and very DS like. I think this game actually is pretty fun though gameplay is more effective on the DS than on the iPhone. The Lemmings style gameplay is very challenging on the iPhone, due to the touch based icon placement. Perhaps if the maps were somehow optimized for the iPhone screen, the game would be more enjoyable to play. Now on the iPad, Arctic Escape is much more effective, since you see the entire map. And if you have an iPad, the good news is, the app is a universal binary, so you get both versions with one purchase. Overall, Given the iPad version, and the clean production of Arctic Escape, it is a very good buy for puzzler fans looking for a challenging iPhone/iPad game combo. Priced at one dollar, it’s affordable too. Your free time will be consumed by these little penguins in no time. AppSafari review of Arctic Escape was written by Joe Seifi on April 9th, 2011 and categorized under App Store, Games, iPad apps, Puzzler, Resource Management, Universal. Page viewed 4359 times, 2 so far today. Need help on using these apps? Please read the Help Page.